Otis (5 yrs) has been unwell and home from school all week. Because he has spent so much time at home I've made note of the materials he has been using. Keep in mind we don't use many of the Montessori school materials at home - because he uses them so much at school. So these are more at home, play, open-ended materials. Here are his favourites from this week! 1. Laminated Butterflies (similar US). These are perfect for under the microscope, on the light table or hanging on the wall! 2. Transparent Pattern Blocks (similar US). We use these exclusively on the light table and often with the small mirrors. 3. 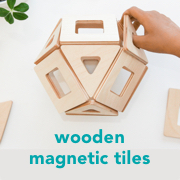 Magnetic Tiles c/o Child.com.au (similar US). Shown in more detail here. 4. Small Mirror (US here). These are small and perfect for teaching symmetry, we most often use them on the light table. 5. Round Light Table. This light table is bright, really light and currently on sale! Our light table is always used on sick days, weekends and when the weather dictates we spend more time inside, the light is soothing and always brightens up a gloomy day! 6. Graduated Beakers (similar US). These are perfect for water or sand play. At five years the children are often interested in measurements and this is why I really like this set. These are measured 100ml, 200ml, 300ml, 500ml and 1,000ml. 7. Alphabet Playdough Stamps (similar US). Yes, these have been very well used, as seen here. 8. Alphabet Glitter Stickers (similar US). Otis is currently learning his upper case (capital) letters and these stickers are popular at home for writing cards, notes, and decorations. 9. Twistable Crayons (similar US). We have many gorgeous crayons at home and Otis chooses to use these, I think it's the fun twistable feature he loves, they never go blunt. 10. Dot Markers (US here). These were such surprise to me, they are probably his most used art materials over the last couple of years! I would never have picked them out for Otis so I'm glad he chose them from the art store. Not very washable so be careful with little ones. Not pictured but also used a lot this week include Otis' Little Bits and woodworking materials (wood pieces, hammer, wood glue, nails, and paint). I hope you are having a good and healthy week! Our preparations for weaning continue. Above is the gorgeous weaning set from At Home with Montessori. I always knew that a real spoon (over plastic) was preferred and I knew a small spoon was best. But really, I thought a tea spoon would be small enough. Have a look at this comparision as it shows how small the weaning spoon really is. I recently purchased the coffee spoon at Wheel and Barrow. I think this would be a good substitute if you cannot get your hands on a weaning spoon, it is still a lot smaller than the tea spoon. The weaning spoon is working perfect for Otis. Although he is showing little interest in feeding himself. Perhaps in time. I hope he isn't enjoying being spoon fed by me too much. Thank you Carrie for the shelf-liner idea, it works a treat. Along with a couple more weeks of development and Otis can now sit at his table. Still for short amounts of time. The shelf-liner does a great job of keeping him from slipping around. I would have never thought of doing this myself! Thank you so much to Aine for lending me her copy of Understanding the Human Being (Silvana Montanaro), it was much needed and very timely. I really needed to revisit the section on weaning. 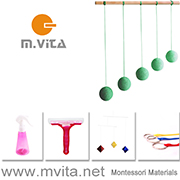 This is in my view the very best book on Montessori for this infant stage. The section on weaning is adequately detailed too. At the moment Otis is enjoying sampling food twice a day. I say sampling because he is only tasting it. He does however move the food around in his mouth, swallows and opens his mouth as to ask for more. He is also enjoying drinking the tiniest amount from his glass. At this age drinking from the glass and eating from the spoon is as much about the experience as anything else. "Once again, simple things in everyday life turn out to be powerful tools and can be used to achieve great physical and psychological results." - S.Montanaro. Understanding the Human Being. As Montessori recommends and Montanaro writes - we are about to introduce Otis to bread. Large, hard pieces for the child to hold and chew on. I want it to be our own home baked bread. Perhaps this weekend. The intent is to introduce food in it's solid state. I know Otis will enjoy holding and playing with it while we eat and even teething on it. He will be six months old next week and already has four, FOUR teeth! Something fun for his feet! I really like the recent posts at At Home with Montessori. Meg writes about each month of a child's life from birth to nine months. It's a good guide and I enjoy looking forward a couple of months to see what I can expect with Otis. I thought it was a little amusing when at five months Meg suggested putting some items on your child's socks for them to explore. Then right at five months Otis discovered his feet. So what did I do? Exactly as she suggested. What are the benefits? I am sure observing your feet like this works a whole range of muscles and it would be good for his concentration. But honestly, most of all, it kept him happy while I made dinner. I chose socks that were snug so he didn't pull them off straight away. When sewing the items to the sock I attached some cotton fabric to the underside for additional strength. He wasn't so happy with the bell, he kept on trying to kick it off. But he loved the big green button! My last post on learning to crawl was a little brief. There are other ways we help Otis to develop his crawling skills. Our aim isn't to have him crawling or walking earlier than everyone else, our aim is to allow him the opportunity to develop at his own pace. Last week I had one really busy day. I went out with friends, drove Caspar to and from school and then went on a lengthly excursion. Otis was either in the pram, Ergo baby carrier or car seat for almost the entire day. While I have discussed my issues with baby carriers here, this type of physical restriction (is that a too harsh way to put it?) is preventing him from learning to crawl. Babies needs lots of time uninhibited on the floor. Really the more time on the floor the better. At home Otis spends most of his awake time on the floor, usually on his movement mat, on the carpet or on a rug. We now avoid rugs or blankets that will bunch up or slide underneath him when he is trying to move. Otis moves the futherest and with the greatest ease when he has no clothes on. At the very least we try to give him some time every day without pants and socks. I like to free up his knees and feet so he can grip the ground and get some traction. He needs this grip or traction to get his knees up under his body as a precursor to crawling. While on his tummy he is working all those important back, neck and arm muscles required for crawling. To keep him interested on his tummy I often put him in front of his wall mirror so he can see himself, his ring on a ribbon or even some grasping materials which he will use until he is tired or wants to try moving again. The most coveted items in our house are Caspar's toy cars. Put one in front of Otis and he will do what ever it takes to get to it. Other items like rattles give him a target. I make sure the item is far away enough to challenge him but not so far to be unachievable. Sometimes we use an item that will move, the interlocking discs or bell or ball cylinder or the puzzle ball are all perfect for this, as the child reaches for them they will gently move further away. This also provides him with a sense of achievement each time he reaches the item. This reward or success is likely to drive him to move further next time. We try (very hard) to hold off on the the clapping and cheering. It can be exciting when we witness our child moving or getting up on their knees. However, to create an environment which supports intrinsic motivation we try to acknowledge him with an "you did it! ", "you reached it" or "look at you there up on your knees". Is anyone else at the pre-crawling, creeping stage? Any tips to share? The bell cylinder in the above photo is from Beginning Montessori. I have seen similar cylinders in toy stores but I love that this one is hand made, wooden and oh so natural. I love the concept of the weaning table and chair. Otis isn't ready to use it yet. At five months and even with a rolled towel for support and blocking him in with the wall and the table he is still not able to use it comfortably. We will wait until he is ready. He is currently tasting foods while sitting on my lap or in his chair at the table like shown here. We decided to go with the Me-Do-It Chair. While he does have the Cube Chair I really like this in his room. The Me-Do-It Chair is sturdy and the seat is shallow so the back supports the child in their seated position. It's a lovely substantial chair. I had some difficulty sourcing an appropriate weaning table. The only tables I could find were really durable and great tables, but they were for the child care market and extraordinarily expensive. So I found the heaviest and sturdiest table and cut... cut the legs. I used a really fine hand saw and was able to make the cut so fine and straight the table is stable. Thanks to Cathy's advice the chair seat is 14cm high and the table is 32cm. I think the combination of the table and chair works well. The table is unfinished timber though, what do you think I should do to it? In Part Two I'll show the table and chair in use. Have you ever made a Montessori Puzzle Ball? Have you ever made a Montessori Puzzle Ball? I would say it's for intermediate sewers and I'm definitely a beginner. But I gave it a shot anyway. There are a couple of things I love about this ball. The way the it is formed so it is easy for the child to grasp, pick up and hold. The way it draws your attention and attracts the eye. It's obviously chewable and because you can make it yourself you know exactly what is in it. I made this one from green and natural linen and put a medium sized bell in the centre to make it that much more special. If you haven't made one before, let me tell you it is harder than it looks. I printed off and followed Meg's tutorial here. I also checked out how Rachael from Little Red Farm did it here. I really liked the sewing challenge but need so much more practice. If you don't have the time, patience or skill you can purchase one from Meg herself at At Home with Montessori. Her's look so much neater than mine! I am not sure if this is the Montessori way. I think there is only one way to learn. That is by trying. It does appear that Otis needs an incentive. He is only interested in moving if there is something to move towards. In this case it's the bell cylinder. As he reaches for it, it rolls further away. He moves 1-2 inches at a time. It's hard work, but he doesn't fuss. What did he do for the rest of the day? Let's just say he slept like a baby. I love taking photos of him sleeping. Is this creepy? Today I actually woke him, he looked up at me then closed his eyes and went back to sleep. Thank you for asking, my content, sleeping baby is back and we are all feeling so much better. Weaning has been on my mind. When I refer to weaning I mean the commencement of weaning - the introduction of foods other than breastmilk/formula. For my first son Caspar, we used the BLW approach. I do believe that each child is different and previously I wasn't even aware of the Montessori approach. With Otis we intend on using a combination of both. Montessori commencing at five to six months with lots of finger/family foods incorporated. There are so many things that I love about the Montessori approach - the ritual, cultivating indepedence and control over the environment. The above table contains my collected thoughts on the two approaches, it also helps to explain a little about them. Click on it to enlarge. As pictured below I am starting to gather our materials - placements, napkins, small glass and bowl. The fabric isn't like my usual choice but I wanted something sweet and special for Otis. You might think it's a little crazy giving a six month old child a glass or bowl but stay with me. I'll let you know (and show you) how we go. Otis has started to join us at the dinner table. Just for a few mintues. He can join in on the conversation. He doesn't eat with us but is observing everything. Observing us eating, chatting and connecting. Those sultanas are for him to push around. He can't pick them up but likes trying. The position is comfortable for him, his feet are flat on the step and he is supported by the cushions. I love how this demonstrates to him that he is an individual (with his own chair) but still very much a part of our family unit.